A Waulking Tour of Scotland takes listeners on a musical excursion, featuring many styles of Scottish music. Waulking the cloth, work usually done by women, would soften tweed and prepare it for wearing. Work songs were sung to pass the time. These songs capture the essence of Scottish life in their words and music, and are used as the milestones on this musical journey. This album is available (in its entirety and in separate tracks) through digital distribution. "Jo Morrison's A Waulking Tour of Scotland was a masterful work. Jo gets more out of the harp than should be possible." "You don't necessarily have to pound tweed in your basement to enjoy this bright, diverse collection of mostly traditional Scottish work songs and harp tunes showcasing material from a variety of Caledonian styles and regions. [...] There are strong call-and-response songs in tongue-twisting Gaelic, brisk dance tune medleys, and delicate harp solos, all crisply performed and comprehensively described in the accompanying notes. 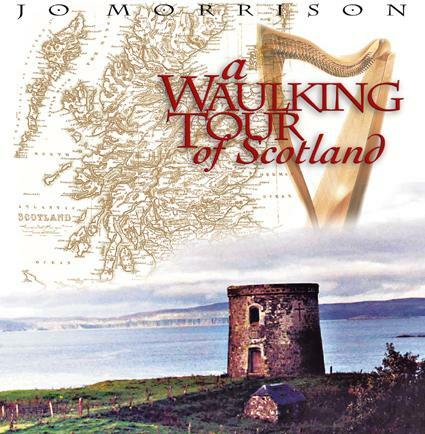 "A Waulking Tour of Scotland, inspired by Morrison's own travels through the Scottish countryside, takes listeners along on a musical excursion reflecting her passion for the country and its rich musical and cultural traditions. ...the whole album is pregnant with sights and flavors of an entire country. The excellent harping holds it all together; the arrangements with a broad assortment of voices and instruments -- particularly several outstanding duets -- make this a musical travelogue from Scotland you'll want to experience time and time again." "Inspired (and how!) by a tour of Scotland that Morrison took with her husband, she again brings together many other musicians to join her for a track or several. She includes a number of songs, as well as tunes, mostly sung in Scots Gaelic." Produced by Heidi Gerber and Jo Morrison. For immediate online purchase using your PayPal account. For credit card purchase through Apple's iTunes. For credit card purchase through CD Baby. Note: Due to software limitations, the normal multiple-item shipping discounts are not available at the exact price quoted here for PayPal purchases. Checks or money orders must be used to take advantage of the exact discounts, or email your order to me directly and after receiving a quote from me follow the directions to send PayPal payment to Jo at harp@triharpskel.com. Sorry for the inconvenience! Artwork and packaging for A Waulking Tour of Scotland by Charlie Glendinning. The album cover is Copyright © 2000 Jo Morrison, All rights reserved. The album cover may not be used without permission. My triharpskele logo is by Amanda Fisher, Pixelations, Inc. The triharpskele logo is Copyright © 1998 Jo Morrison and Amanda Fisher, All rights reserved. This web page is Copyright © 2014 and all sound clips are Copyright ©2002 by Jo Morrison. All rights reserved.